1. “Planning is needed, firstly for committing and allocating the organisation’s limited resources towards achieving its objectives in the possible manner and, secondly for anticipating the future opportunities and problems.” Elaborate this statement and discuss the underlying concepts as you have experienced in organisational situation. Briefly describe the context, you are referring to. 2. Briefly referring to various models of Decision making process, explain the one/s you have experienced to be favourite in any organisational situation and why. Explain with context, and brief of the organization, you are referring to. 3. What are the major forces for change that confront an organisation? Briefly describe the process of organisational change, and relate it to the experience you have had, or you are aware of. Briefly explain the context and the organisation you are referring to. 4. “The term centralization and decentralization are meaningful only in a relative sense. Centralisation and decentralisation are extensions of delegation. Delegation refers mainly to entrustment of responsibility and authority from one person to another. Downward transfer of responsibility and authority at individual level is referred to as delegation and when the same is done organisation-wide in a systematic way it is known as decentralisation”. Elaborate this statement and discuss the underlying concepts with reference to the organisational experience your have or are aware of. Please give a brief of the organisation and the context you are referring to. 1. Explain the process of job analysis. Describe how job analysis is carried out in the organisation you are working with or an organisation you are familiar with. 2. Discuss the concept of mentoring. Explain methods of mentoring that you are familiar with citing suitable organisational examples. 3. Discuss in detail the laws covering wages, welfare and benefits. 4. Describe industrial democracy in your own words with illustration. Buy this ignou mba assignment from distpub. Currently we are working on this latest ignou assignments and need 2-3 days for this solution. 1. Explain the critical elements of politico- legal environment of business citing examples and examine the interaction between political environment and business management. 3. What are the factors responsible for industrial sickness? Discuss the measures and policies adopted by the government to tackle the problem of industrial sickness in both non- Small Scale Industries (SSI) and SSI sector. 4. Discuss India’s foreign investment policy in the post-reform period and highlight the major changes with relevant data. 5. Briefly review the impact of economic reforms in India in terms of their achievements and failures citing examples. 1. Explain the meaning of Generally Accepted Accounting Principles? Discuss in brief about the Accounting Concepts that are being followed in your organisation. Give your suggestions if any. 2. Discuss the different methods of depreciation and how these methods differ from each other. (a) The amount of fixed costs incurred by the firm. (b) The Break Even point for the firm (both in rupees & units). 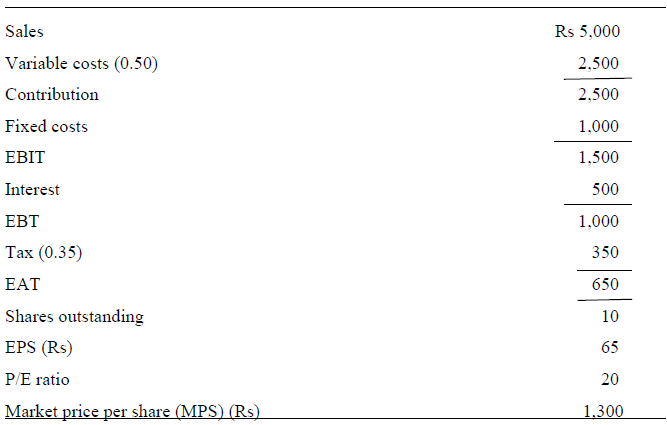 (c) The amount of sales to earn a profit of Rs 25 crores. (d) Margin of Safety if actual sales of ABC Ltd is 17.5 crores. 4. XYZ Ltd is a leading manufacturer of decorative and industrial paints in India. The income statement (Exhibit 1) and the balance sheet (Exhibit 2) for the current year are given. Its sales next year are estimated to be 25 per cent higher on account of increase in demand for paints from the housing and commercial real estate sectors. The variable costs as percentage to sale are likely to remain constant. An increase of 12.5 per cent is estimated in fixed costs. XYZ Ltd is planning to launch two new brands of luxury emulsions-Supercoat and Luxurycoat. The Supercoat paint would generate an additional Rs 600 crore sales and require an extra Rs. 400 crore investment involving installation of manufacturing and packaging machinery. While the additional fixed costs requirement would be Rs 150 crore, variable cost to sales ratio would not change. For manufacturing the Luxurycoat paint the additional investment requirement and sales generated would amount to Rs 600 crore and Rs 800 crore respectively. The variable cost ratio would remain constant but the fixed cost are expected to increase by Rs 240 crore. 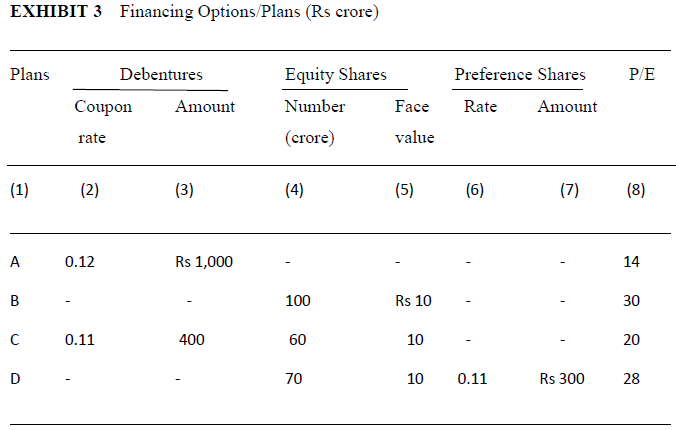 The XYZ Ltd has four alternative financing plans to choose from (Exhibit 3). Its current debt-equity ration is 5:1. (1) What would its operating, financial and total leverages be next year without the new proposal? (2) Assuming that the XYZ Ltd finances the projects using financing plan (A), determine the three leverages for the two projects individually. Which new brand is better? (3) Which financing option should XYZ Ltd choose to if only Supercoat is to be manufactured? (4) Calculate the financial breakeven points of each plan. 5. In your organisation or any other organisation of your choice try to find out the factors that are taken into consideration while making the dividend decisions.